We are a leading Manufacturer of bollywood suits, exclusive salwar suits, exclusive anarkali suits, exclusive designer suits, exclusive fancy suits and exclusive ladies suits from Delhi, India. We are well acknowledged for offering a smartly designed range of Cotton slub suits . Our Party Wear Casual Suits is stitched using the best quality georgette fabric and the newest technology. For its exclusive patterns, offered Party Wear Casual Suits is highly cherished by our valued clients. Provided Party Wear Casual Suits is comfortable in nature. Our clients can buy offered Party Wear Casual Suits from us at competent industry relevant price. We are one of the well-known manufacturer, exporter, supplier, distributor, wholesaler and trader of Exclusive Salwar Suits. The offered exclusive ladies suits are very popular for the suitability to the festive occasions and social gatherings. Our supplied ladies suits are designed and cut, according to the latest fashion and trend. The offered ladies suits are exclusive dress material, which are popular among every culture and region. We are one of the well-known manufacturer, exporter, supplier, distributor, wholesaler and trader of Exclusive Anarkali Suits. The offered exclusive ladies suits are very popular for the suitability to the festive occasions and social gatherings. Our supplied ladies suits are designed and cut, according to the latest fashion and trend. The offered ladies suits are exclusive dress material, which are popular among every culture and region. We are one of the leading manufacturers, exporters and suppliers of a qualitative assortment of Exclusive Designer Suits. Our designers make use of skin friendly and quality assured fabric in designing the offered exclusive ladies suits. To meet the precise needs of our customers, the offered exclusive ladies suits are available with us in various sizes, designs and colors. Suruchi Creations supply and offer very high quality Exclusive fancy Suits. Suruchi Creations have very wide ranges of Exclusive Ladies Suits such as Designer Patiala Salwar Suits, churidar Salwar Suits etc. Our party wear Exclusive Ladies Suits are fabricated with very high quality fabrics and are exclusively designed for party to make the wearer looks trendy and elegant and these Exclusive Ladies Suits are available in various patterns. 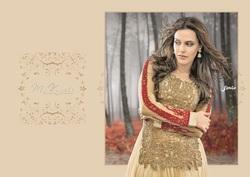 Suruchi Creations supply and offer very high quality Exclusive Ladies Suits. Suruchi Creations have very wide ranges of Exclusive Ladies Suits such as Designer Patiala Salwar Suits, churidar Salwar Suits etc. Our party wear Exclusive Ladies Suits are fabricated with very high quality fabrics and are exclusively designed for party to make the wearer looks trendy and elegant and these Exclusive Ladies Suits are available in various patterns. We are a customer focused organization, which is engaged in manufacturing, trading, exporting and supplying a trendy assortment of Exclusive Fabric Suits. Inspired from the contemporary trends in the fashion industry, the offered fabric suits are stitched using premium quality fabric and decorated with the finest embroidery work. Our offered fabric suits are available in various alluring colors, designs and sizes that are perfect attire for our women patrons to wear on any various festive occasions. Looking for Exclusive Ladies Suits ?